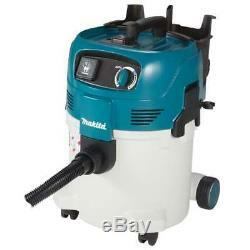 MAKITA VC3012M/1 Wet and Dry M Class 30L Dust Extractor Vacuum Cleaner 110V. The Makita VC301M wet and dry vacuum cleaner is approved for Dust Class M in accordance with the EU standard. This product features Push and Clean filter cleaning system and innovative hose storage solution with two clamps on the backside of the tool boxIt includes a washable PET fleece filter with high filtration performance and durability that protects turbine by holding back fine dust and debris. The robust plastic container comes with 2 wheels and 2 castors for excellent stability and mobility. Floor nozzles and extension tubes can be fixed onto the body for convenient storage. Built in air flow sensor beeps when air flow is reduced by clogged filter, full tank etc. Automatic On/Off function activates the machine when a connected power tool is used (this feature works only with the 240V version). Power cable storage with 3 fixation points on the motor head and tool box. The item "MAKITA VC3012M/1 Wet and Dry M Class 30L Dust Extractor Vacuum Cleaner 110V" is in sale since Wednesday, January 16, 2019. This item is in the category "Home, Furniture & DIY\DIY Tools & Workshop Equipment\Power Tools\Other Power Tools". The seller is "toolboxsuppliesltd" and is located in Chepstow. This item can be shipped to United Kingdom, Austria, Belgium, Bulgaria, Croatia, Cyprus, Czech republic, Denmark, Estonia, Finland, France, Germany, Greece, Hungary, Ireland, Italy, Latvia, Lithuania, Luxembourg, Malta, Netherlands, Poland, Portugal, Romania, Slovakia, Slovenia, Spain, Sweden, Australia, United States, Canada, Brazil, Japan, New Zealand, China, Israel, Hong Kong, Norway, Indonesia, Malaysia, Singapore, South Korea, Switzerland, Taiwan, Thailand, Chile.